Our Guest Speaker will be Diane Truderung the Director of Fund Development and Communications at L’Arche Winnipeg. Diane’s past job experience includes Executive Director of Transcona Biz and Director of the Clothesline Program, Manitoba and Saskatchewan Division for the Canadian Diabetes Association. She also researched and wrote Transcona’s centennial book, Transcona’s Story, 100 Years of Progress. Diane is also the recipient of the Mayor’s Award from Transcona Biz, and the Award of Merit from the City of Winnipeg. 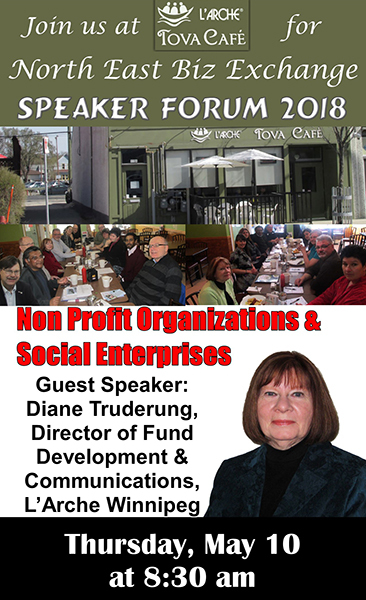 Diane will be speaking on the subject of “Non Profit Organizations and Social Enterprises” educating us about the important services Non Profit Organizations provide for our community and what we can do to help.